The Penrith and District Red Squirrel Group are getting up close to the dwindling red squirrel population thanks to £1,700 from the HSBC Fund. Eight new trail monitoring cameras were bought and set up to get more information about the squirrels in their natural environment. The cameras are documenting what goes on at the feeding stations and will give invaluable information about feeding times and habits. Volunteers will collate the images to create a permanent record of these habits which will show whether adults or young squirrels are involved. 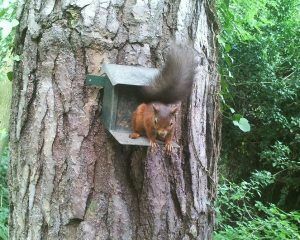 The group will also be able to monitor and record both red and grey squirrels. The Penrith and District Red Squirrel Group was set in 1994 by local people concerned about losing their red squirrels if something was not done about grey squirrels encroaching on the area and becoming established as they had in the rest of England. Julie Bailey, Treasurer of the group, said: “There are only about 20,000 red squirrels left in England, mostly in Cumbria and Northumberland, and their decline is directly attributable to grey squirrels, introduced from America in 1876, and whose population has exploded.